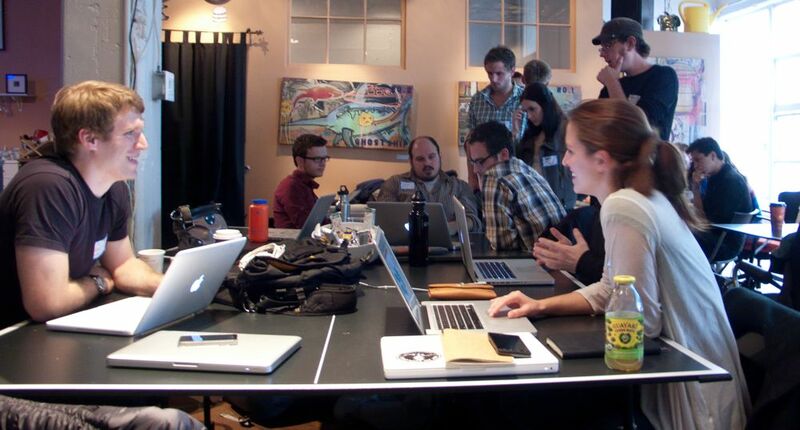 Designers learn best by working with other designers. However, modern team sizes mean that virtually all startups can only afford to hire a single designer and an entire generation of designers is emerging that has never had that experience. I wanted to create an organization that would increase the proficiency and productivity of designers by providing them with a chance to do the kind of collaborative design work one might find in a studio based environment. From the start, I wanted the Product Design Guild to be an organization that great designers would want to participate in. Great designers, by their very nature, are busy people so, as well intentioned as they may be, lower priority commitments inevitably get bumped. I thought that the only reliable way to convince busy people to come was if coming would save them time over not coming. That is, spending an hour designing at the Product Design Guild would be more productive than spending an hour designing alone. After the introductions and lunch, meetings are left deliberately unstructured and members self-organize in order to work most effectively. Effective design collaboration requires understanding and trust. By pre-vetting our members, any designer can start working with any other designer and know that their suggestions come from a place of expertise and experience. This allows for groups to form and disband fluidly and rapidly. Our rules set up an expectation of helpfulness and productivity that affects the conversational tone. Because one of the shared requirements is that everyone has to bring work, conversations are started around the project. Each meeting is 6 hours long which allows for designers to fully explore the depth and nuance of a design problem. The timeframe naturally affords in depth exploration. Setting each meeting at a different company allows designers to be exposed to multiple design cultures. During each meeting, I am constantly figuring out who should meet who, trying to maximize the utility of having lots of smart designers being in the same room as you. These deliberate design decisions have resulted in the steady, high quality growth of Guild membership and transformative experiences for those who attend. I am responsible for all marketing & promotion. You have good experience. This article gives me a new way of taking my visualization. External Battery for iPhone for iPhone. Zoom in on an extended battery juice pack provider that guarantees the quality of the product as well as has a proven track record in after-sales service. I love this. thanks for sharing us.